Shiwen Mao has been playing the guitar since high school, but he claims he’s not very good. Perhaps he’d be shredding some Metallica tunes like the heavy metal band’s lead guitarist Kirk Hammett. But Mao simply doesn’t practice as much as he used to. He instead devotes his time and talents to his wife and teenage son and his job. He is the Samuel Ginn Endowed Professor of electrical and computer engineering and director of the Wireless Engineering Research and Education Center at Auburn University’s Samuel Ginn College of Engineering. His research, specifically his focus on next generation wireless technology, is what keeps him up late on Saturday nights. The current fourth generation, or 4G, wireless technology operates most smartphones today, but 5G isn’t far behind. The problem is wireless technology changes so quickly, it’s not about being a step ahead of the competition, but being miles in front of the pack. “If you aren’t ahead, the competition at MIT, Stanford, Georgia Tech or in China, who are studying the same technology, will pass you by,” Mao said. Mao was one of three Auburn faculty members recognized at the 2018 Faculty Awards with the university’s Creative Research and Scholarship Award. The honor acknowledges the research achievements and contributions of faculty who have distinguished themselves through research, scholarly works and creative contributions to their fields. Mao first became interested in engineering when an elementary school-aged Mao learned to assemble a radio. He earned a bachelor’s and Master’s in electronic engineering and a bachelor’s degree in business management from Tsinghua University in his native China. Mao didn’t know what to do next until he attended a job fair on campus. He admitted he had “very limited knowledge” about programming computers, so he didn’t think a company like IBM China Research Laboratory would be interested in him. He was educated as an electrical engineer, after all. After a year on the job, Mao said he realized earning a doctorate would open more doors for him within the company and beyond. So he and his wife, a fellow engineer, moved to the United States and began graduate school together at New York University. Mao received a master’s in systems engineering and a doctorate in electrical and computer engineering from NYU’s Tandon School of Engineering. He was a postdoctoral research associate and then a research scientist at Virginia Tech University before joining the faculty at Auburn’s Department of Electrical and Computer Engineering in 2006. 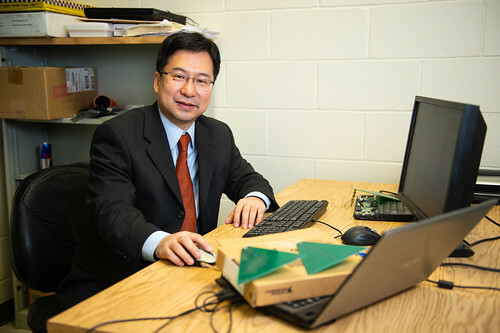 Besides research in next generation wireless technology, Mao studies wireless applications. A recent creation is SonarBeat, a contact-free vital sign monitoring system. The system uses a smartphone to transmit signals into open space. A similar system developed by Mao’s group, termed PhaseBeat, uses Wi-Fi signals to detect both respiration and heart rates. Mao’s research into applications also involves the use of radio frequency identification, or RFID. He said small RFID tags can be implanted on the hand, allowing the bearer to open a door with a simple wave. Tags attached to clothing can monitor a person’s vital signs and sleep conditions. Mao is currently working on a project in Auburn’s RFID Lab that involves using an RFID tag on a hand to navigate a drone. Mao appreciates being able to teach and conduct research at Auburn because both allow him to work with students, graduate and undergraduate. He has found that getting to know his students — their backgrounds and personalities — affords him the opportunity to teach each of them as individuals. There’s no mass production in Mao’s class. For example, Mao said he once saw a student of his working at a restaurant. He learned that the student worked multiple jobs to pay for college. Research and teaching are opportunities for Shiwen Mao to work with students. The Samuel Ginn Endowed Professor of electrical and computer engineering conducts research in next generation wireless technology and wireless applications. A recent creation is SonarBeat, a contact-free vital sign monitoring system. 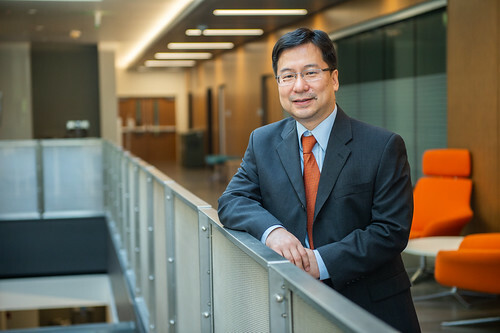 Shiwen Mao is one of three Auburn faculty recognized with Auburn’s Creative Research and Scholarship Award at the 2018 Faculty Awards. Mao is the Samuel Ginn Endowed Professor of electrical and computer engineering and director of the Wireless Engineering Research and Education Center at Auburn’s Samuel Ginn College of Engineering.